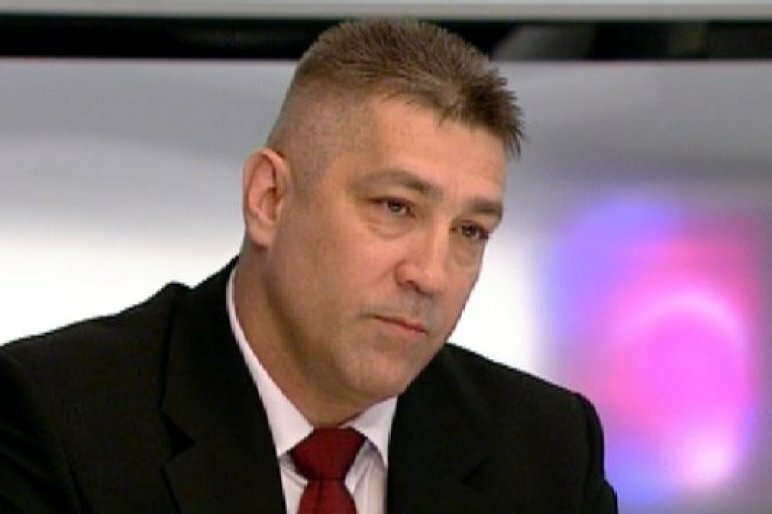 TEK Chief Director János Hajdú speaks to ATV on November 24, 2015 (photo: ATV). The Hungarian News Agency (MTI) reported on November 24, 2015 that the Orbán government-founded Counter Terrorism Center (Terrorelhárítási Központ, or TEK) had conducted a counter-terrorist operation in which it apprehended a group of people who possessed automatic weapons and explosives (source in Hungarian). Counter Terrorism Center Chief Director János Hajdú subsequently told Hungarian Television that on November 20 TEK had arrested two people in a motor vehicle containing automatic weapons, live ammunition, magazines and silencers, while on November 21 the organization had arrested four more people in a motor vehicle transporting explosives on the outskirts of Budapest. Hajdú said during an interview on opposition television station ATV later on November 24 that TEK had “found a genuine bomb laboratory” during a house search conducted in connection to the arrests. The TEK chief director told ATV that “the two individuals who may have been part of extremist circles were likely on the threshold of an operation and the chances of abuse of firearms was great.” Hajdú stated during the interview that “the possibility that the group operating the bomb laboratory belongs to a terrorist organization cannot be excluded.” The TEK chief director noted that two of those arrested in the motor vehicle containing explosives as it entered Budapest were Hungarians and two were foreign citizens. (source in Hungarian). In its justification, the court said that there is no information contained in the [submitted] documents demonstrating that the suspect, who lives with his mother and step father and takes a hobby-level interest in the Second World War, maintains contact of any kind with organized criminal groups or terror organizations or that he wished to use his acquired knowledge and chemical materials to threaten individuals or the public order. Neither is there any information demonstrating that the present case is connected to any other criminal cases or investigations initiated over the recent days. All of the circumstances surrounding the case point to the contrary. Neither is there any information regarding extremist viewpoints or foreign connections beyond the fact that two of his associates are, as he, Hungarians from Slovakia and are of the same age and interests. The court also emphasized that the suspect has a clean criminal record and is currently the subject of no criminal procedures. The Counter Terrorism Center serves a dual purpose as both a classic special weapons and tactics (SWAT) organization and a secret service providing the Orbán government with protection and political support (see Marching to Praetoria). TEK’s highly publicized arrest of people whom organizational Chief Director János Hajdú deceptively intimated were well-armed foreign terrorists was presumably the product of professional incompetence and the overzealous implementation of the explicitly or implicitly assigned political task of maintaining public focus on the threat of terrorism as a means of promoting the Orbán government’s anti-migration policies. TEK in action (photo: index.hu).